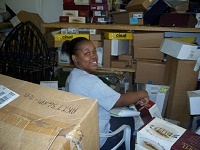 AWDA Mayor’s Youth Program worker, Jasmine Owens ,sorts and organizes inventory at the Center. As landfills continue to impact our environment, The Fuller Center is making a move to reduce waste from its projects, and encourage others to do the same. The LifeCycle Building Center, a joint project of The Fuller Center for Housing and Charitable Connections, Inc., has opened its doors for business thanks to major donations from NARI members, NKBA members and HD Supply. On June 19, 2010, The LifeCycle Building Center opened its doors at 900 Wendell Court, Suite C. Michelle Uchiyama of Charitable Connections, Inc. said that “the west coast has been recycling and repurposing building materials for at least a decade, and we are just catching up here in the south.” Mark Galey, President of The Fuller Center for Housing of Greater Atlanta, Inc. stated that “NARI members and NKBA members have taken to the idea of recycling the material from their projects.” Many of the cabinetry, appliances and decorative items from remodeling jobs can be reused by other homeowners or can be made into art like Fuller Center volunteer Laurie Sturgis has done. The center is located at 900 Wendell Court, Suite C, Atlanta, Georgia 30336 and is open from 10:00 a.m.to 2:00 p.m. Monday through Friday and by appointment on Saturday. Please call 404-274-2406 for more information. This entry was posted in Posts and tagged Atlanta Fuller Center, charitable connections, Fuller Center of Atlanta, mark galey, michelle uchiyama. Bookmark the permalink.